We were delighted that Mom Does Reviews tried our soaps and wrote about her experience. Below is an excerpt from her review. You can read the entire piece on her blog. They are BIG- one bar will last you twice as long as a normal bar. Lots of lather that you’ll love! Don’t you hate those soaps that you can never get to lather? The fluffier the lather, the better it feels on my skin. Shugar soaps are made in the USA! Shugar soaps are never tested on animals. AND the soaps are Vegan- they never contain animal by-products. The scents are pleasant without being overbearing. Even the packaging is 100% recyclable! a perfect complement to their completely biodegradable soaps. They never use artificial colors, preservatives or chemicals or petrochemicals. 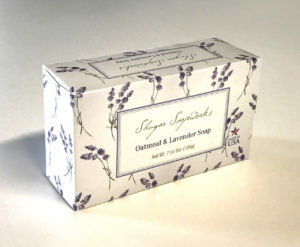 My favorite soaps so far are the Lavender & Oatmeal and Lemon. They both lather up easily. When I feel a little stressed, I use the Lavender, when I need a little pick-me-up, I use Lemon!